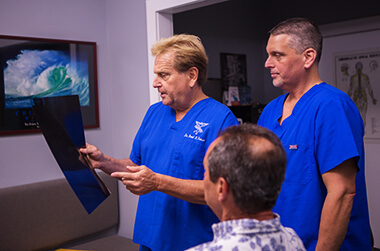 As your go-to Hilton Head Island chiropractors, our team at Fraum Chiropractic Life Center is here to help you achieve optimal health and wellness through skilled chiropractic care. Our techniques and methods can be used for pain relief, improvement in health and wellness, and treatment or management of any number of injuries and medical conditions. Chiropractic care focuses on the careful treatment and manipulation of the spine to treat problems related to the body’s central nervous system and musculoskeletal system. Specifically, chiropractic care is noninvasive and does not involve the use of medications or other drugs to treat symptoms. Instead, our techniques are used to target symptoms at the source and help patients find long-term relief. For more than a century, chiropractic techniques have been used to help people manage and treat medical disorders, ensure better posture and improve overall wellness. In some cases, chiropractic care is a less expensive and a better alternative to seeking care from a medical physician for neck and back pain. Studies show a potential savings of nearly $84 million per year across the United States by choosing chiropractic care. One of the most common services we provide is that of the chiropractic adjustment. This technique works to carefully manipulate the spine to improve its alignment. In turn, this can effectively relieve symptoms, including ongoing neck and back pain, headaches and migraines and more. That’s because, when the spine is properly aligned, the entire central nervous system is improved, and the body can function more efficiently. Another common treatment featured in our office is spinal decompression therapy. We often recommend this advanced treatment for those suffering from a herniated disc or sciatica. These conditions are both caused by excessive pressure being placed on the vertebrae in the spine, causing discs to be forced out of place or for sciatic nerve pain to be triggered. By decompressing the vertebrae in the spine, we can achieve much-needed relief of pain and disc pressure. Chiropractic spinal adjustments are also highly recommended for pregnant women to make labor easier and to ensure a more comfortable pregnancy. Whether you’re suffering from pain or are simply interested in seeing how chiropractic care can help you lead a better life, we invite you to contact our office to request an appointment. We’ll work to find an appointment date and time that works with your schedule!